The ARTINO Arts Group of Los Angeles present a Group Exhibit celebrating Mexican Independence Day. Group Exhibit celebrating Mexican Independence Day. OPEN TO THE PRESS & PUBLIC: Tuesday, Sept. 2nd - 6th. ARTIST'S RECEPTION: Saturday, Sept. 6th. 7 - 10 pm. CLOSING PARTY: Saturday, Sept. 27th. 3 - 6 pm. EXHIBIT ENDS: Tuesday, Sept. 30th. 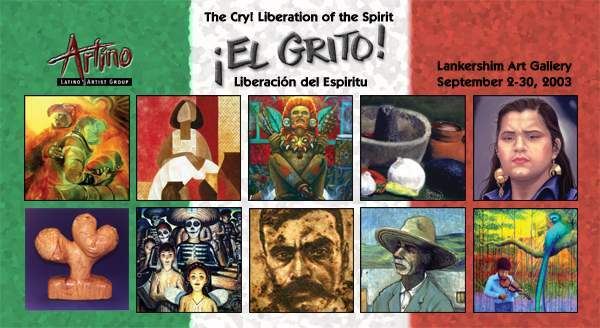 The ARTINO Arts Group of Los Angeles will hold a month long exhibition titled "El Grito - Liberacion del Espiritu" (The Cry - Liberation of the Spirit). 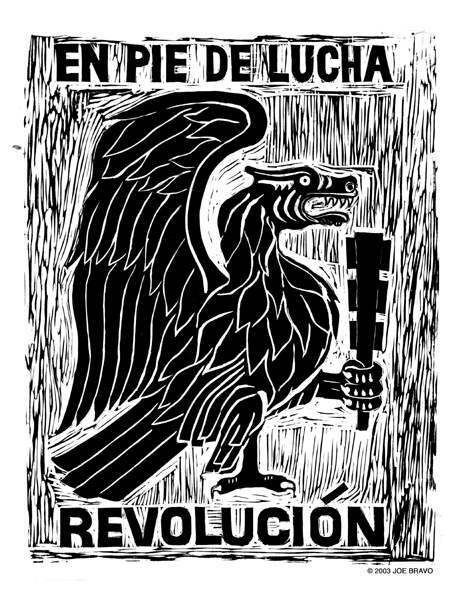 The exhibit will focus on the impact the historic Mexican anti-colonial struggle has had on the peoples of the Americas. In particular the Artists will explore the interplay between Mexico and the U.S., past and present struggles for liberty and democracy, cultural identity - immigration, and the celebration of heritage... all through the eyes of Latino Artists living in L.A. The ARTIST'S RECEPTION will be held at the Gallery on Saturday, September 6th., from 7 to 10 pm. The Artists will be on hand to greet you and answer questions concerning their latest artworks, and new Giclée Prints will be made available for the first time. The public will also have an opportunity to bid on specific artworks in a silent auction. ARTINO member Xavier Montes will perform traditional Mexican songs on his Paraguayan Harp, and T.J. Bolero will also be providing musical entertainment. The exhibition's CLOSING PARTY will be held late afternoon at the Gallery on Saturday, September 27th., from 3 to 6 pm. The Artists will be on hand to answer questions concerning their artworks. The public will also have an opportunity to win Prints in a special raffle. There will be Spoken Word performers, a Jazz Band, a Dance Performance honoring the over 300 Women who have been murder victims in Juarez Mexico, and other surprises to round out the afternoon. The ARTINO Arts Group of Los Angeles is a collection of Artists who have come together to bring a greater appreciation of Latino Art to the world. Members work in a variety of styles and mediums with an emphasis on their Latino cultural roots. The group has held many exhibitions in and around Los Angeles, including a show at the famous El Pueblo Gallery on L.A.'s historic Olvera Street that attracted some 14,000 people. MARK VALLEN (Creates contemporary Social Realism and political graphics). FRANK MARTINEZ (One of L.A.'s original 1970's Muralists). LALO GARCIA (Designer and Painter of religious icons). AGUSTIN BRAVO (Traditional Painter and founder of the ARTINO group). SERGIO HERNANDEZ (Illustrator and Cartoonist for the legendary late 60's Chicano Magazine, "Con Safos"). JOE BRAVO (Painter & Muralist). RICARDO ORTEGA (Painter of Chicano iconography and indigenous spiritual themes). LIX MARIO RAMIREZ (Creates traditional and nontraditional sculpture). XAVIER MONTES (Paints with acrylics, musician, and founder of the De Colores Art Show in Santa Paula). FELIX PEREZ (Painter of the urban apocalypse and Chicano iconography). Designed by noted architect Charles Lee and built in 1939, this gorgeous building is a perfect example of Streamline Moderne architecture. Originally used to house the Department of Water & Power, the structure was declared an L.A. Historic Cultural Monument in 1980. Today the building serves as the premiere Art Gallery for the NoHo Arts District of North Hollywood. Run by Artist/Curator Dover Abrams and Gallery Coordinator Jill Peterson, the "Lank" as it's affectionately known, is a 1300 square foot artspace that is quickly becoming the jewel of the Valley Arts scene. On September 16th, 1810, Miguel Hidalgo y Costilla launched a revolution that would not only lead to Mexico's independence from Spain, but would revolutionize the course of world history. At the dawn of that fateful morning, Hidalgo, a Catholic Priest with a primarily Indian congregation at the village of Dolores, ordered the arrest of the town's hated Spanish oppressors. Father Hidalgo then rang the Bell at his Church to call the Indians and Mestizos (those of mixed Indian/Spanish blood) to rebellion. The well-educated liberal Priest delivered a fiery speech from the balcony of the Parish that exhorted the people of "La Nueva España" (New Spain) to rise in rebellion against their cruel Spanish masters. His famous Grito de Dolores (Cry in the village named Sorrows), of Viva Mexico! Long Live Independence! was the beginning of the end for Spanish rule. In modern Mexico, Hidalgo is revered as the Father of Mexican Independence. Every year at midnight on September 15th., Mexicans shout the grito to honor the bold and courageous actions of a people yearning for freedom.